Derry City's Patrick McClean runs away celebrating after scoring the opening goal against St Patrick's Athletic. 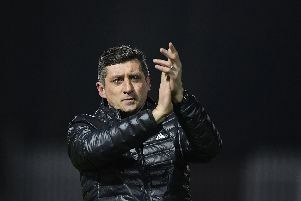 Declan Devine's side raced into a 3-0 lead after just 30 minutes thanks to goals from Patrick McClean, Gerardo Bruna and Junior Ogedi-Uzokwe. The Dubliners were rightfully reduced to ten men when Kevin Toner was red carded following a poor challenge on Ciaron Harkin. St Pat's striker Gary Shaw headed home moments after Ogedi-Uzokwe's goal to bring the ten men back into the game, but in truth Harry Ke never really looked like getting back into the encounter. 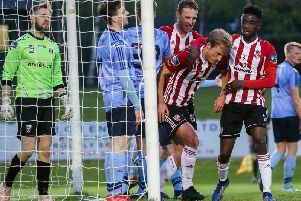 The victory moved Derry up to second spot in the Premier Division table and means Friday night's home clash against Shamrock Rovers, is a top of the table encounter.